For the first time the FIFA World Cup™ was broadcast in colour around the globe and tens of millions watched spellbound as Brazil brought added brilliance to the spectacle with a glorious exhibition of attacking football that deservedly earned them a third world crown. The Brazilians' 4-1 Final triumph over Italy gave them the right to keep the Jules Rimet Cup and provided the perfect farewell for Pele on his final appearance on the world stage. Pele had threatened not to return after his bitter experience in England - where he was literally kicked out of the 1966 tournament - but he returned and took his place in a team rich in forward talent. The front five of Jairzinho, Pele, Gerson, Tostao and Rivelino were all No10s in their own right and together they created an irresistible attacking momentum. Nothing captured the beauty of their football better than their fourth goal in the Final at the cavernous Azteca Stadium, Pele teeing up his captain Carlos Alberto to conclude a seven-man move by arrowing a first-time shot past Enrico Albertosi and into the far corner. There had been fears before the finals about the conditions facing the players - intense heat and high altitude - and these worries were exacerbated by the decision to stage matches at midday to suit European television schedules. It was not the only sign that times were changing: there were now two substitutes allowed per team, red and yellow cards for the referees, and an adidas ball, the white-and-black checked Telstar. The highlight of the first round was the meeting of holders England and champions-elect Brazil. It featured the most famous save in FIFA World Cup history, Gordon Banks somehow stopping Pele's goal-bound header by pawing the ball out from the bottom corner and back up over the crossbar. Brazil won 1-0 through a goal by Jairzinho, who made history by scoring in every round, but this proved their stiffest test. England captain Bobby Moore, in particular, produced a career-defining performance that belied his pre-tournament difficulties, having been detained by the Colombian authorities in Bogota after he was falsely accused of stealing a bracelet. There were promising showings by newcomers Israel – who qualified after Korea DPR refused to play them and duly held Italy 0-0 in their opening match - and also Morocco. The North Africans led against West Germany before eventually succumbing to Gerd Muller's late decider, the first of ten goals for the Golden Shoe winner. Muller then registered successive hat-tricks against Bulgaria and Peru, before his extra-time strike decided a dramatic quarter-final against England. The West Germans trailed 2-0 with 23 minutes remaining in Leon before Franz Beckenbauer and Uwe Seeler brought them level. Ironically Geoff Hurst, scorer of a controversial goal against West Germany in the Final four years earlier, then had an effort disallowed before Muller's match-winning volley. England would bemoan the absence of goalkeeper Banks, taken ill beforehand, but for Helmut Schoen's men this first competitive win over the English was the sweetest possible revenge for 1966. The Mannschaft's never-say-die spirit then helped produce an epic semi-final against Italy, which witnessed the highest-scoring additional period in the tournament's history. Karl-Heinz Schnellinger's 90th-minute equaliser forced extra time at 1-1, precipitating a flood of five goals, including another two for Muller, before Italy prevailed 4-3, European Footballer of the Year Gianni Rivera netting the winner against opponents whose captain Beckenbauer played on with a dislocated shoulder. While West Germany would take third place, European champions Italy, who had earlier eliminated hosts Mexico, were now through to a first Final since 1938. But despite a defensive excellence personified by Giacinto Facchetti and the scoring touch of Gigi Riva, they were clear underdogs. Brazil had dazzled en route to the Final. Mario Zagallo may have replaced Joao Saldanha as coach only three months earlier but his squad spent that time preparing intensively. After defeating Czechoslovakia, England and Romania, they reached the semi-finals by bettering a Peru side coached by the Brazilian Didi, a team-mate of Zagallo's in 1958 and 1962. The Peruvians had qualified for the finals at Argentina's expense and boasted exciting young striker Teofilo Cubillas but they could not contain the Seleção, going down 4-2. Brazil then exorcised the demons of their 1950 Final defeat with a semi-final success against Uruguay. 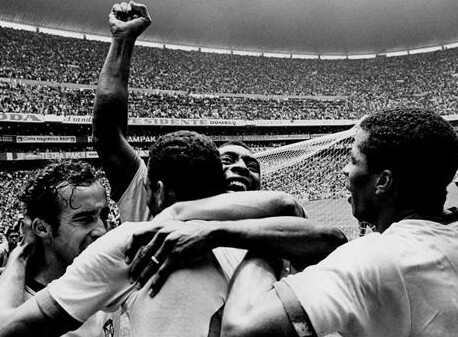 Trailing 1-0, they hit back through Clodoaldo, Jairzinho and Rivelino although more memorable was a moment of audacity by Pele that encapsulated his unique genius. Reaching Jairzinho's pass ahead of goalkeeper Ladislao Mazurkiewicz, he let the ball run past him. Mazurkiewicz's momentum left him stranded but Pele ran beyond the custodian, picked up the loose ball and shot narrowly wide. It was Pele, seeking his third winner's medal, whose powerful header opened the scoring in the Final and although Roberto Boninsegna equalised, there was only going to be one outcome: Gerson, Jairzinho and Carlos Alberto struck in the second period and Brazil were champions. Even Rome's Messaggero newspaper had to admit the Azzurri "were beaten by the best footballers in the world".